Helping students to understand the effect of sport & sleep on their mental state. Collecting & analysing data on the effects of sport and sleep. We learned from Julia Bleasdale how an olympic player exercises and what effect it can have on ones body. We found fun correlations from our survey (not necessarily what we expected): 1) People seem not to be very happy when they go to bed. (in average 5.8 out of 10) 2) People that sleep 7 hours are more happy, but are less active. People that sleep more than 8 hours are more lazy and don't feel happy. We discussed for quite some time if this is necessary, if students want such an incentivation. We collected data on how active people are, how much they sleep and how they feel. Then we analysed the data. 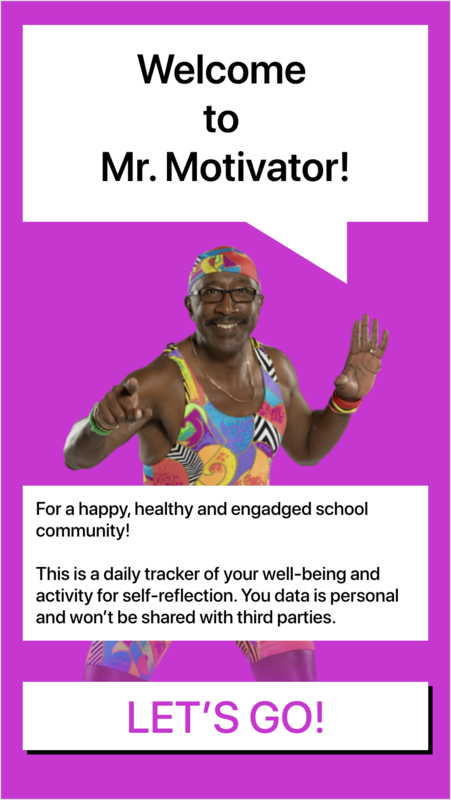 Develop a mockup of an app that collects more data on sport & sleep in a fun way "Mister Motivator". The app asks for 2 kinds of information: 1) how much do you sleep, how much activity do you have (on a scale) 2) how happy are you, how energised are you, how motivated are you? With time, the app shows a visualisation of the correlation between these two parts. For all of us it is very difficult to understand the effect of sport and sleep on our bodies. Even though the highly positive effects on our mental capabilities have been proven by many studies, most people are still not aware of it and (therefore?) not acting on it. Technologies allow us to track and measure our activities and thereby help us become aware of correlations between our behavior and our body's state. We want to enable students to take advantage of these new possibilities in order to motivate themselves to sleep and exercise enough. All in all, the project aims to: 1) enable students to document and analyse their sport and sleep cycles 2) improve their understanding of its effect on their cognitive strength 3) incentivise students to sleep and do sports regularly. During the Hackdays we want to take a first step: Develop a concept that helps students to motivate themselves to sleep and exercise enough. This can be done through gamification ("make it playful"), reward systems ("get remunerated") as well as collective comparisons ("I can be as good as you") or goals ("we can make it"). It is recommended to use some kind of tracking systems (like Fitbits, apps or questionnaires) for this task, in order to prove what you've done. Who are you? This project does not have a specific owner or leader – it's all up to you to make the most out of this idea! :) Nikki, co-organiser of the Open Education Hackdays, will be there to support you with tips & tricks.